I am writing this story for my 77 year old father that has been hunting our property, and only our property, for over 60 years. 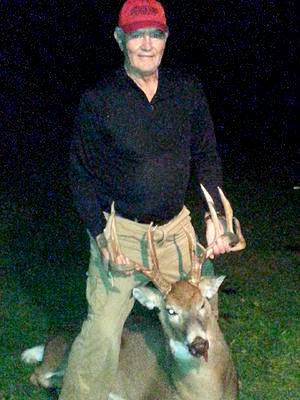 He has not been able to hunt as much as he would have liked for the last few years do to some health issues, but this year he was feeling better and he was pumped for the season. We have an orchard on our property that is a transition area from the thick beading area behind it and I have been getting pictures of several mature 3 1/2 year old and up bucks coming and going from the orchard. We built a 6 ft. x 6 ft. by 7 ft. tall "Dura shed" stand for my dad in the middle of the orchard. Its an easy in easy out stand that he can get in and out of with little effort. This buck I have on film at least 8 times last year but no pictures of him at all this year. We were just hoping he was still here. Well opening day came and my dad was up early and in the woods well before first light, which is unusual because of the health issues he had been having. 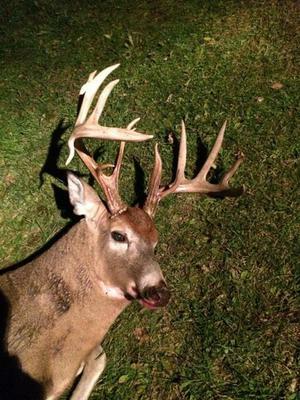 He put in a six hour shift opening morning that once again was a first for a long time. We went up for lunch and I grabbed a quick sandwich then me and my son headed back out right away. My dad came back down around 2:30 pm. At about 4:15 pm I caught sight of two doe working their way through a thick pine to the lower left part of the orchard and about five minutes later I noticed a very tall mature buck on the same path the two doe were on. I tried to scope him up to get a better look, but it was to thick. The last I saw of him he was heading for the orchard, but then it looked like he turned left and stayed out of the orchard. A couple minutes later I saw the two doe coming out of the lower left of the back of the orchard heading back to where they came from and I was wondering if he was still following them. As they were moving slowly back to where they came from I heard the crack of my fathers 30-06 and the phone call that followed... "I think i just shot a monster and I'm going to look now." I started climbing down and before I hit the ground I heard the roar of what sounded like a 16 year old that just shot his first deer! 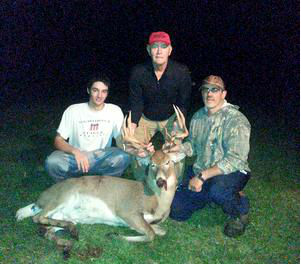 I cant tell you the feeling you get when you walk up to your 77 year old father and see the look on his face as he is standing over a 170 plus inch 14-point monster! The truth is you really never know how much time you have left with the ones who taught us about this awesome sport. It's moments like this that make all the effort, time, patience and dedication we put in worth it. My son joined us in the woods and 3 generations of men who are passionate about this sport made a memory that will last a lifetime.. and to me, ladies and gentlemen, is what its all about!